Do you desire to be slimmer, trimmer, healthier, and fit? Do you need Papa God’s supernatural help to get that way? If so, pray this prayer for weight loss and health with me! When you do, you’ll see God work miracles on His part PLUS send you His grace, strength, and anointing to help you with your part! Yesterday, the Lord told me to read Romans 8. That chapter was nowhere on my Bible reading plan for today, so I wondered what He had in mind. 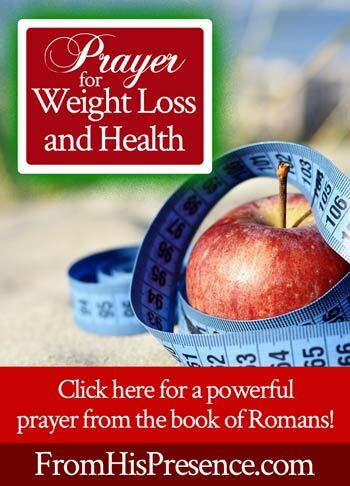 I began to read, when all of a sudden, a verse LEAPED off the page at me–and Holy Spirit started talking to me about weight loss, of all things. For years, I weighed a slim 145 pounds. I could eat anything and do anything, and still I weighed 145 pounds. It was great! But then, stress began catching up with me. I went through a few years of depression also, and that made things worse. The pounds piled on. Then, last year, I had a baby. I gained a lot of weight during pregnancy, as one does. 🙂 I have gotten pretty much back to my pre-pregnancy weight at this point. BUT, my pre-pregnancy weight is still 3 pants-sizes too big. … and so do you. Do you struggle with getting fit and healthy too? Getting healthy and looking good is one of the biggest things people struggle with. But you know what? It doesn’t have to be that way. Why? Because Father God cares about your health. He cares about your body. Jesus paid the price to heal you and bring you victory in ALL areas–including your health and weight. By the stripes of Jesus, you are healed. Healed of all sickness and all disease–including obesity. Yes, even if you got yourself into this mess, as I did. So yesterday, as I was studying, Holy Spirit threw me His promise to help me with weight loss and health. Then He told me to write about it–because it’s for you too. But if the Spirit of Him who raised Jesus from the dead dwells in you, He who raised Christ from the dead will also give life to your mortal bodies through His Spirit who dwells in you” (Romans 8:11). How do you know if this Scripture applies to you? If you have made Jesus your Lord, then you do have His Holy Spirit–the “Spirit of Him who raised Jesus from the dead”–dwelling inside you. He took up residence in your heart the moment you gave your life to Jesus. How does this Scripture apply to weight loss? But Romans 8:11 says that Father God, who raised Jesus from the dead, will give LIFE to our mortal bodies–yes, that means in this lifetime, not just in Heaven–through His Spirit. And since Father will give life to our mortal bodies, that means Father will help us be healthy and fit and of the proper weight. Yes, of course you do; I do too. We have to exercise, eat healthy foods, and generally care for our body. The good news is that Papa God has something to say about that too: He will actually help you do everything you need to do. He’ll do His part, and He’ll help you do your part. That, my friend, is amazing news! Therefore, my beloved, as you have always obeyed, not as in my presence only, but now much more in my absence, work out your own salvation with fear and trembling; for it is God who works in you both to will and to do for His good pleasure” (Philippians 2:12-13). Did you get that? He works in you to help you WILL–in other words, to help you want to–AND DO His good pleasure. He gives you the “want to” and helps you carry it out. Beloved, we have to do our part to get healthy and fit. BUT GOD–He has promised to help you. I am the vine, you are the branches. He who abides in Me, and I in him, bears much fruit; for without Me you can do nothing” (John 15:5). But you know what? WITH HIM, we can do everything. Absolutely everything. “I can do all things through Christ who strengthens me” (Philippians 4:13). And I am learning more and more that the way to see that activated in our lives is to apply it to the hard things–the things that we feel defeated on; the things we feel are impossible. When we apply Papa’s promises to the hardest things, we’re testing Him. More than that, we’re testing our own faith. Stretching it. Forcing it–forcing our faith to fill up the nooks and crannies of our lives; the dark places that we haven’t let Holy Spirit access yet. God will always prove true when we test Him. But when you test Him and force our own faith to expand, not only will you grow spiritually, but you will also see results. “Father God, I come to You in Jesus’ name. Papa, thank You for sending Your Son Jesus to die on the cross for me. Thank You for forgiving my sin. Thank You, Jesus, for being the Lord and Savior of my life. And thank You, Father God, for sending Holy Spirit to live in my heart now that I have made Jesus my Lord. Papa God, Your Word says that, if Holy Spirit dwells in me, then You will give life to my mortal body through Him–through Your Spirit. I know You are referring to this body I live in now, for my heavenly body will be my immortal body–not my mortal one. And I know that Your Word says my body is the temple of Your Holy Spirit, and it belongs to You. I am not my own. Papa, I desire to glorify You with my body. I also desire to feel good; to be healthy, energetic, and strong. I desire to look good too. I desire to be and look fit and healthy and muscular, with no excess body fat, because I know that is Your will for me–and it will make a world of difference in my life too. So, Abba Father, I submit my body to Your Lordship. I ask right now in Jesus’ name that You would give life to my mortal body through Your Spirit. I ask You both to help me do my part and I’m asking for Your miracle assistance. Please fire up my metabolism right now, Lord, and let my body begin to burn off the fat. Let the pounds melt away, Lord, without having the increased metabolism make me hungrier. And Father God, since Your Word says that You are working in me both to want to do Your will AND to actually carry it out, please help me right now both to will and to do for Your good pleasure. Help me desire to be healthy and fit more than I desire to eat. Help me desire to eat healthy food more than I desire to eat unhealthy food. Help me desire to look good more than I desire to satisfy fleshly cravings. Help me choose healthy foods over unhealthy ones every time. Give me wisdom to know what foods are good for me and which foods are bad for me. Help me choose to drink water, rather than drinking unhealthy things. Help me choose to exercise purposefully every single day. Help me choose to be active, even during my ordinary activities, every single day. Convict me about every single thing I do that is unhealthy, Lord–everything. I hold nothing back from You. Search me, O God, and know my heart. Try me and know my thoughts. See if there be any wicked way in me; and if there is, GET IT OUT! And lead me in Your way everlasting. Father, I can do nothing without You. I can do nothing without Jesus and Your Spirit. But WITH YOU, I can do all things. I confess Your Word that I can do all things through Christ who strengthens me. I confess Your truth that, with You, all things are possible (Matthew 19:26). And I confess that You are transforming me right this minute, activating and demonstrating all Your truth in my life as I believe and obey You. Please help me to keep track and watch for Your answers to my prayers. Help me to track my weight and my progress. Help me to keep caring about my body and get healthier every day, from now through the rest of my life. And next year at this time, I will be completely different. I believe it, Lord, for I choose to submit to You–and day by day, I know I will see You giving life to my mortal body as we work together to manifest Your will in my life. Does this word leap in your spirit? Did you pray the prayer–and will you dedicate this area of your life to Jesus’ lordship? If so, please leave a comment below! Jamie, this is a very timely message and one I need to implement right away. I pray for both our success at getting healthy. God bless. This is for me Jamie. God is so awesome. I was thinking and making confessions about the same topic and then saw your email. God bless you greatly. God knows us better than we do. The message is so relevant to my life. Thanks for the revelational knowledge. Stay blessed. This Is Definitely A confirming message from God that he put this on your heart to share. I was looking at myself in some photos that were taken of me today after church and I immediately became embarrassed and depressed about the wait I have gained over the last couple of years and I know that without Gods help I can not do this on my own and I am praying for his strength to help me and to pull me through, I want to be everything he has called me to be and I need to be in perfect health and at s healthy weight I need to lose 40 lbs and I know I can do all things through Christ! Perfect timing as always! I’m in!!! This prayer covered everything I needed to pray. So so beautiful. You teach us to depend on Christ for all things and I love that. Oh yes ? it did,praise God! Oh yes I Jesus name Thank you Lord in advance Amen! Yes this message is timely for me but it’s just opposite. I’m praying to gain healthy weight instead of losing. Thank you so much Jamie, I pray to see amazing results for everyone. Lets all look great in Christ. ? Wow. Ok. Let’s do this. Your blog and ministry bless me so much. You are so right on. Thank you so much. Bless you. Do you have any material about vision boards? How do you keep track of all that God says to you? Greetings in the name of our Papa Lord. yesterday i was discussing about my body with my daughter that i have gained so much weight even all my clothes are too small and now this morning when i opened my e-mails i came across this article then my stomach stated burning as i read in so much that i could not stand it i went to the ladies and there is so much fat coming out like is (gastro) and comong back from the ladies room by body is light light. Jamie thank you very much i really needed this. Jamie, I have been praying Romans 8:11 over this issue, so thank you for this entry. I have been failing in my own efforts – but the addition of Philippians 2 really sings to me! I am excited to keep you posted. Thanks so much! God’s timing is impeccable! I have been struggling with eating too much (especially at night) and experiencing reflux. I am so thankful for experiencing the consequences for my behavior, but much more thankful for an answer to my prayer on stopping the behavior! God bless you for being so transparent. This subject has been very heavy in my heart and my thoughts. Thank you for sharing and for the encouragement and reminder of God’s love for us that you post everyday. With all the holiday celebrations (usually involving not so healthy foods) the timing of this is perfect! God bless you and as we celebrate Jesus this season may we all do it in health and in his perfect will for us! It is well with us all in Jesus name. I decided to read this because of the health part. I understand the need for weight loss but some of us(me) need to gain some weight. I am within the healthiest weight range but when i look in the mirror i feel like wailing. I did a 3day water only fast, was terribly ill for some time and depressed over some family issues and just name it. well, i went further lean. I do not want to look like those skinny models and crazy enough everybody wants to look like me. Am in my mid-forties but look twenty……. Thanks Jamie at least i know my cry of Holy Spirit Help!!! each time i look in the mirror is not praying amiss.